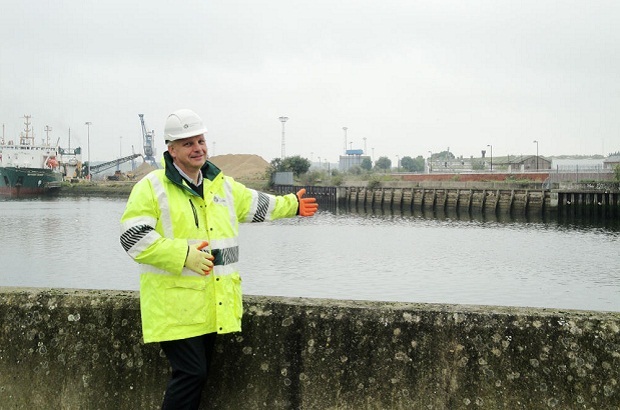 My name’s Andrew Usborne, I'm the project manager for the Ipswich Flood Defence scheme, a multi million pound flood project to upgrade Ipswich’s flood defences. Ipswich is one of the oldest towns in England. Dating back to the seventh century, its success was down to the trade that passed through its bustling port, earning it the name: ‘the trade capital of the East Anglian Kingdom’. Like many port towns, as the nature of shipping changed to a more efficient and automated industry, the warehouses that stored the goods gradually took on new lives as cafe bars, apartments, public spaces and tourist attractions. Such a transformation has been taking place in Ipswich over the last 15 years. Whilst the cafe bars are cool, sophisticated and modern, you couldn’t say that of the flood defences. Built in the 1970s, the defences that serve the waterfront area need to be upgraded to better protect existing infrastructure, to enable future development and, put simply, to give the people of Ipswich the defences they deserve. That’s exactly what we’re doing with the Ipswich Flood Defence Scheme. 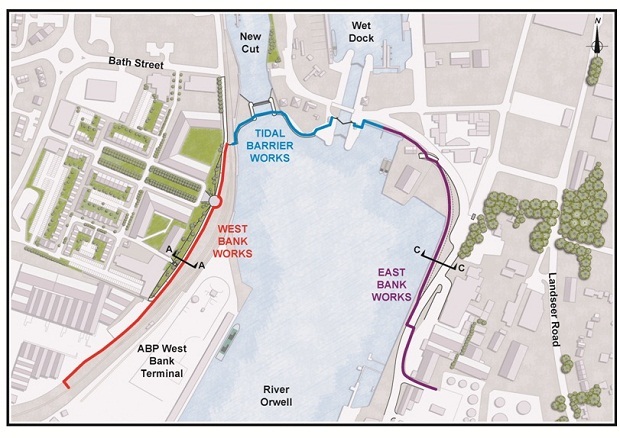 The Environment Agency and partners are investing more than £58M over the next three years in a tidal barrier across the main waterway, accompanied by new and refurbished sheet piling - steel walls driven into the riverbed. Similar to the Thames Barrier, although quite a bit smaller, the 20 metre wide gate will rise during periods of extreme high tides to hold back the North Sea and, with the help of the sheet piling, keep Ipswich dry. When finished, the works will reduce the risk of flooding to 1,608 homes and 422 businesses and support key infrastructure such as the fire station and council buildings. Everything upstream of the barrier will be protected against a tidal surge like the one experienced in 1953 and, more recently, in 2013. That will be hugely reassuring to the home and business owners on the waterfront, many of whom suffered thousands of pounds worth of damage and disruption after the tidal surge in 2013. The project is now moving into an exciting stage. Over the last 2 years I’ve been overseeing preparations on the ground, including the diversion of a major power cable that supplies energy to the port of Felixstowe, 15 miles away. In November, the big machinery moves in. Firstly, a 200 tonne crane will unload the steel sheet piles. These are necessary to strengthen the embankments whilst we build the tidal barrier. Then in the spring, a dredger will be scooping tonnes of silt from the channel before even bigger cranes arrive to build the cofferdam, a temporary watertight enclosure pumped dry to enable the barrier’s construction. I’ll be sure to keep you posted along the way. Everyone has their own part to play in protecting themselves and their home from the risk of flooding. Tidal barrier looks fabulous. 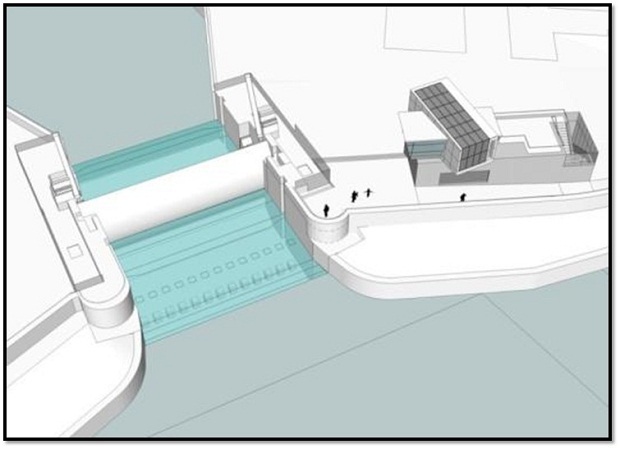 Can it also be used to keep up the river level from London Rd, past the Station Hotel and along to the new cut? This would provide wonderful opportunities for more waterfront space, and leisure activities like those in Cambridge and Norwich. At present we have mud flats half the time. I run a group called Behind the Scenes, we are part of the East Suffolk U3A. We have monthly visits and tours to see local businesses, projects and charities and my group would be really interested in seeing Behind the Scenes with the development of the barrier with a talk and a tour maybe now to see the development and plans etc and then again maybe once it's in place and finished.......would this be at all possible?